Join Dash and the RI Bicycle Coalition for a monthly series of free classes, throughout the spring. 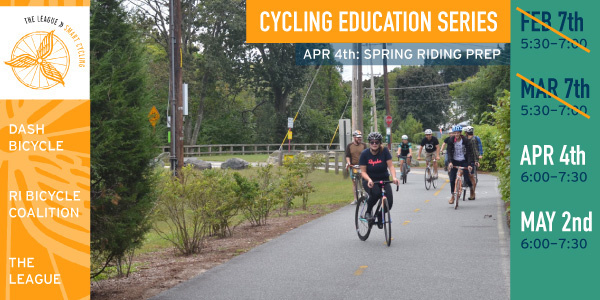 April's free class is Thursday, April 4th, 6:00-7:30pm, and we will share some of our favorite riding routes around the city and out of town. We will also go over topics including bike maintenance, ride-planning, and road safety, and we'll take the group for rides once the weather gets warmer. These classes are free and open to everyone in the community, of all ages and ability levels. Classes will be led by cycling advocate Donny Green, a retired pro cyclist, and current head coach of local cyclocross team 1 PVD Cycling. Join us in the community space, bring all your questions and a friend. We'll bring the pizza and drinks.